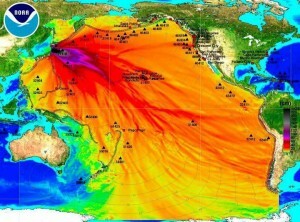 After two and a half years, the Japanese still have not contained the fallout from Fukushima. It has morphed into a lethal threat to planetary life which clearly requires a global response. Instead, the Western media and our “leaders” have been largely silent. This article explains that the danger is actually three-fold, not including Japanese incompetence and corruption. There are three major problems at Fukushima: (1) Three reactor cores are missing; (2) Radiated water has been leaking from the plant in large quantities for 2.5 years; and (3) Eleven thousand spent nuclear fuel rods, perhaps the most dangerous things ever created by humans, are stored at the plant and need to be removed, 1,533 of those are in a very precarious and dangerous position. Each of these three could result in dramatic radiation events, unlike any radiation exposure humans have ever experienced. We’ll discuss them in order, saving the most dangerous for last.